Anyone who has grown houseplants is familiar with the dracaena, a tropical plant that grows in low light and doesn’t need much water. The plant is used outdoors, too, sold as a “spike” for the middle of containers. But why settle for green when you can have maroon, red, or purple foliage as a centerpiece or as a stand-alone center-of-attention plant? In the same family as dracaenas and just as easy to grow are the cordylines from New Zealand. They are used outdoors in pots and then moved indoors to live as houseplants until the next wave of warm weather comes along. If you live in USDA Zone 9 or higher, you can plant them directly in the garden and leave them outdoors year round. One of the best new cordylines is a hybrid, Cordyline banksii x pumilio ‘Red Fountain.’ It grows in a clump from the ground. Its strappy leaves cascade over the tops of companion plants or hang gracefully over the sides of a container. 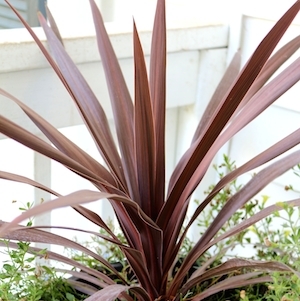 Red Sensation Cordyline is a beautiful foliage plant that grows straight up from a center spike just like a dracaena. As it elongates, the bottom leaves die back. It can actually grow into a tall tree with a tuft of foliage at the top. One of its common names is cabbage palm for the long stretch of its trunk with leaves on top. 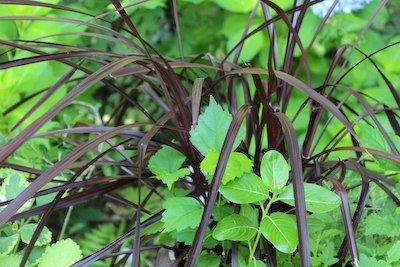 Cordylines are easy to grow in sun or part-shade. If you are moving them outdoors from a winter inside, be sure to keep them out of direct sun until they acclimate to the outdoor sunlight. 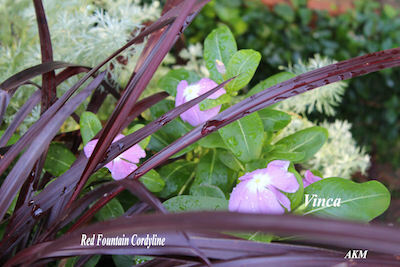 Give them water when they are dry and feed a couple times a summer with an all-purpose fertilizer. Move indoors to a freeze-free area before the first frost of fall.